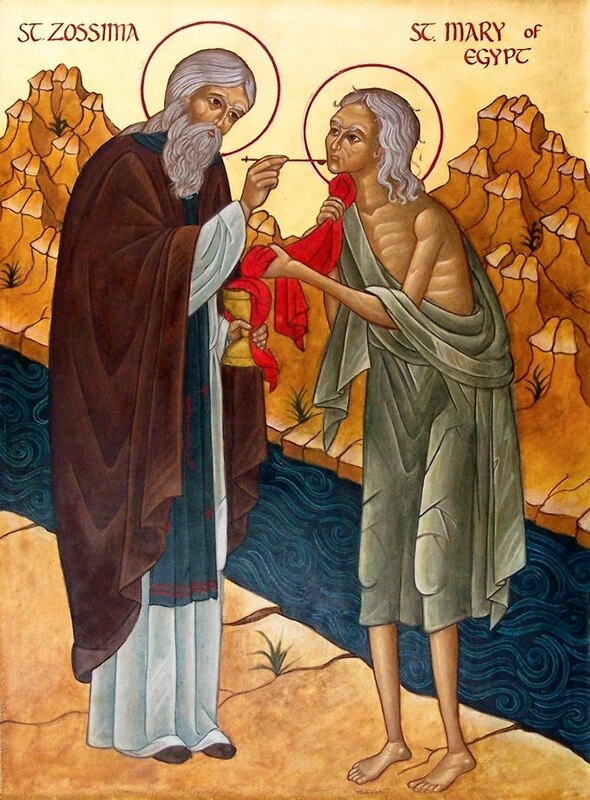 This telling of the life of St. Mary of Egypt (Feast day April 1) has been “cleaned up” for younger ears. I received it from Dn. Mark Barna, who received it from Fr. Thomas Moore, who attributes the text this way: Written for children by A. Prince Source: http://www.roca.org/OA/28/28g.htm. 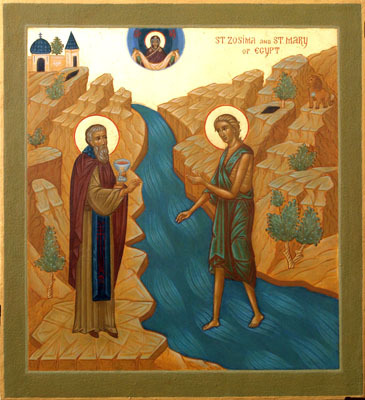 About 500 years after the Resurrection of our Lord, a holy monk by the name of Zosimas lived in a monastery by the Jordan River. He had lived as a monk since childhood and when he was about 50 years old he began to think that he had surpassed all the other monks in virtue and that no one could teach him anything he didn’t already know. To prevent such a prideful thought from taking root, God taught him a lesson. It was the custom in the monastery that at the beginning of each Great Lent, after Liturgy on Forgiveness Sunday, the monks would cross the Jordan and scatter throughout the desert where they would stay until Palm Sunday. Each monk would spend this time alone before God, in fasting and prayer, without anyone around to praise him for his struggles. Terror seized the monk as she called him by name; how did she know it? Turning aside, he threw his ragged cloak her way. Then the woman wanted to know why he had come and how Christians lived in the world. He said that by her holy prayers Christ had granted them peace, and asked her to continue to pray. Reminding him that he, too, must always pray, she turned toward the East. Father Zosimas heard only whispers and looked at the ground in meek confusion. When he began to think her prayer was very long, he looked up to see her standing in the air about three feet above the ground. Bowing down with tears and begging God’s mercy, he begged her to tell him of her life, so that the wisdom and treasure of God might not be hid. “My story,” said the woman, “will make you run as from a snake. You must forgive me for what you will hear, for I lived a shameful life and felt no shame. At only 12 years old I ran away from my parents, threw away my purity, and then trampled upon it with every sinful person I could find. I loved to drink wine and feel pleasure and lead others into sin; and for 17 years I never tired of any kind of sinning. “One day I saw a crowd going to Jerusalem. Since I had no money, I promised some men that I would help them pass the journey in merrymaking if they would take me with them. With crude jokes they agreed. I am amazed, Abba, that hell did not open beneath the ship and swallow us alive. But God desires the repentance of even the worst sinner. “Within a few days of our arrival, I saw a large crowd hurrying to church, I was told, for the Feast of the Exaltation of the Cross. Out of curiosity I joined them. But when my foot touched the doorstep, my body was held back by an invisible barrier. I could not enter, though I tried hard several times. Becoming tired, I let people push me aside and stood in a corner of the porch. Above me I saw an icon of the Pure Mother of God, and I began to understand that my sinful life was keeping me from entering. I turned to the icon in tears and begged the Holy Virgin to help me get inside to see the life-giving Cross, promising to give up everything and go where she would lead me after that. “‘O Lady, never leave me!’ I cried, and was on my way. Someone gave me coins and I bought three loaves of bread. By the grace of God they fed me for several years; for the rest of these 47 years I have been fed by the Word of God and plants I find. “But, Father, how sinful memories attacked my mind and soul like wild beasts! Dirty songs, desire for wine and rich foods, and bad companions; my clothes wore out and I suffered greatly from the heat and cold. I was strongly tempted to return to my old life. But in my thoughts I always turned to the Mother of God, and she has always kept me safe, chasing away evil thoughts and restoring peace to my soul.” With these words she finished her story, begging the Abba to pray for her soul and not tell anyone about her until she died. 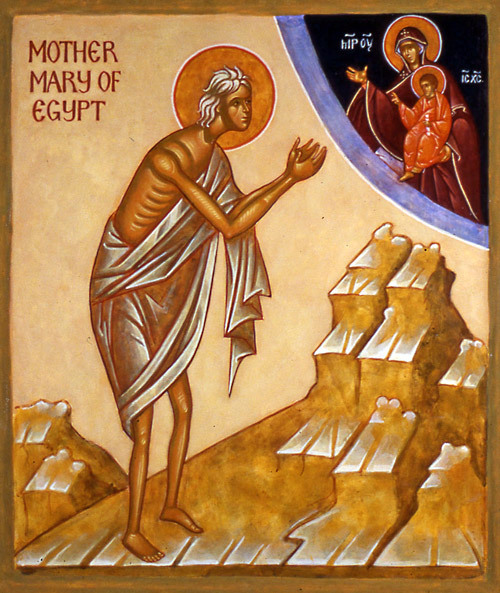 The next year, on the day of the Last Supper, Zosimas brought her the Holy Mysteries, and she walked across the Jordan as on dry land to receive them. He gave her Holy Communion, and promised to come again the following year. 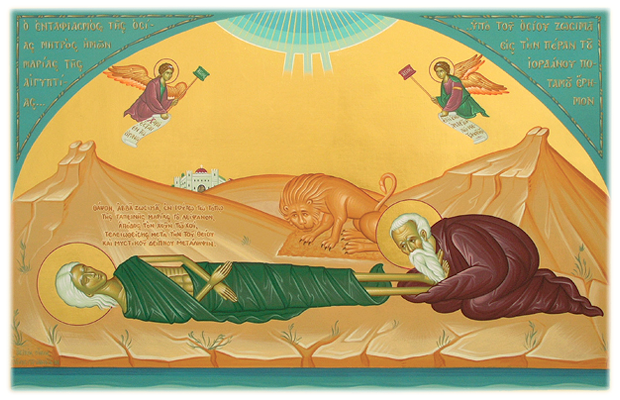 Again leaving the monastery for Great Lent, Zosimas found her at the appointed place, lying in eternal repose, wrapped in his mantle with her face toward the East. In the sand she had written her name, Mary, and instructions for her burial; she also wrote that she died on the day, a year before, that he had brought her Holy Communion. Father Zosimas could not think how to to bury the saint, for he was weak and had no tools. But just then a lion appeared, and willingly dug her grave with his paws. 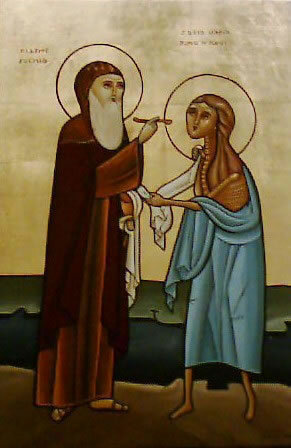 Covering St. Mary’s feet with tears and kisses, the holy elder committed her to the earth with prayers. Then the lion went off into the desert, and the elder returned to his monastery where he told the story which has been kept to this day, bringing glory to God and hope to sinners. May the merciful God give to us all St. Mary’s willingness to repent, and the protection of the Holy Virgin to help us. Amen.